Product review engineering is simply a process by which employees review an existing product (usually within the first six months of launch) to identify requirements gaps and to suggest improvements. At GlobalLogic, we typically create a team that consists of developers and QA engineers who actually worked on the product (i.e., the knowledge holders) and a group who has no experience with the product (i.e., the fresh eyes). Together they review the current features of the product leveraging their own unique knowledge bases and even conduct market research to identify future development opportunities, from new market trends to new security requirements. 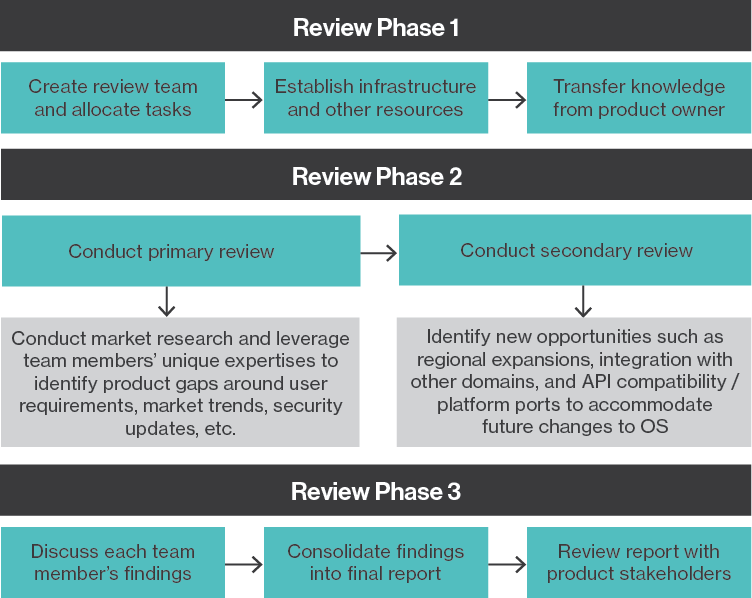 Below is a sample workflow of a product review engineering process. The great thing about product review engineering is that it doesn’t require the use of a specific tool such as Scrum or Jira. You simply write down your observations and then work with your team to publish a formal report at the end of the review. Another benefit is that it substantially increases the knowledge base of the team. Not only do the “freshers” learn about a new product, but they are also potentially exposed to new domain and technology knowledge. Even the developers and QA engineers who initially worked on the product get to expand their domain knowledge by conducting market research. As a result of product review engineering, employees can build their skill sets and offer innovative ideas on future projects. Although the product review engineering process can be extensive, we have not found it very difficult to attract volunteers. Many times when you are working on a project, you are completely engaged in your particular tasks, whether it’s writing code or searching for bugs. Product reviews give employees an opportunity to look at the bigger picture and take part in activities outside of their typical duties. It also empowers them to make a real impact on a product or (in our case) a customer relationship. The prospect of being personally responsible for a product’s future evolution is very exciting. Finally, product review engineering is beneficial for services companies such as GlobalLogic. Since our primary goal is to help our customers be successful through long-term partnerships, we are always looking for new ways to innovate. By proactively reviewing a customer’s launched products, we can offer them more than just maintenance services. The process also aligns the Delivery and Account Management teams, ensuring that everyone is on the same page regarding a customer’s products and future opportunities. This multi-team approach is crucial to smoothly managing a customer’s long-term product roadmap. While product review engineering is still a relatively new concept, it has significant potential to improve both an organization’s product management and employee innovation programs. Not only is it a relatively simple process, but it can easily be tailored to any organization’s requirements. I have personally participated in several product reviews at GlobalLogic, and I really believe that it is the answer to helping product companies exceed user expectations. Vaibhav Pathak has over six years of software engineering experience and is currently a senior lead test engineer at GlobalLogic. His areas of interest include RCS and synchronization-based applications, OEM layer and OEM integrated applications, device self-services applications, and next-generation network applications.